I have this Custom Farmhouse Canvas Art $23.49 (Retail $46.99) on my mantel and LOVE it. 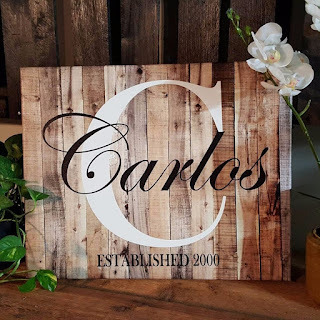 A statement piece over a mantel or on a gallery wall with family photos, this custom personalized "NAME" canvas will add interest and sophistication to any room. This custom piece is offered with a stylish farmhouse pallet wood background with white initial and date. The last name will be printed in classic black. Great for wedding gifts, or birthday gifts! This piece the perfect decor for any family room, master bedroom, man cave, and/or office.